So, as well as paying for women to have Double D breasts because they're depressed they were born with Double A's; as well as paying for fatties to have gastric bands because they refuse to stop stuffing their faces, the NHS has now decided that our hard-earned cash should be spent treating three-year-olds who think they were born in the wrong body. Seriously? Your average three-year-old can't decide whether he wants fish fingers or baked beans for tea. So how on earth would he know he was born in the wrong body? And how would such a young child be able to express that kind of emotion? It all sounds like PC nonsense to me. However, not according to experts at the Tavistock and Portman Trust - two NHS hospitals which specialise in gender issues - which says the numbers of Under 11's referred to them has quadrupled in the last four years. And nearly a third of those were aged between three and four. Note the grand total of three year olds who've been referred to the NHS is two. And puffing that the number has quadrupled (in six years) when the earlier number was just 17, is what's known as base rate fallacy. And what's wrong with offering them counselling? Transgender kids is clearly this month's thing. Here's Louis Theroux more level-headed look at the media's latest moral panic broadcast on Sunday. Paris Lee wondered, What's the big deal? Why do some people get so worked up about policing gender norms? PS It doesn't have to be this way, Paris Lees on trans teen suicides, Attitude. 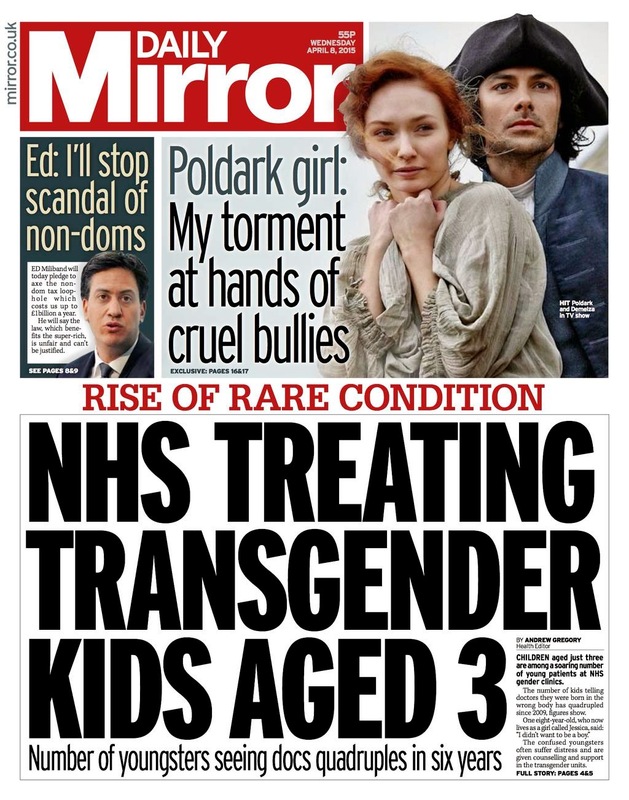 * Edit: You may want to compare and contrast this with How can a child of three need transgender counselling?, asks Libby Purves, in the Mail, Thursday. Never ceases to amaze me how willing people who have ZERO experience, expertise or understanding of trans issues feel their opinion matters.